Supplementing Vanity: What Are You Really Taking? In this article about the final sporting sin, Vanity, the Australian Dental Association asks us to look more critically at the sports supplements that we take, instead of accepting that they are everything they claim to be. Many sports supplements haven’t been rigorously tested and may therefore not be doing everything they claim in terms of giving you the physique you are after. But more importantly, many supplements contain acids and sugar, and, as we’ve seen this month, these definitely put your teeth at risk. The ADA suggests that to be truly health conscious you need to take a holistic approach to supplements: is it really healthy to cause irreversible damage to your teeth under the guise of ‘good health’? The ADA have published a Sports Drinks Fact Sheet (click here) which gives some more great advice around reading the label. The ADA’s number one tip when buying sports supplements is to examine the labels before you buy: if the supplement contains sugar or ingredients like citric acid (food numbers 330 or 331), ascorbic acid (food number 300) or any other acidic preservatives, it might be best avoided in favour of a tooth-friendly alternative. Also of concern are beverages that are being marketed as ‘Pre-Workout Drinks’, which often contain the three worst ingredients for teeth: sugar, acid and caffeine. Intra-Workout drinks, which are designed to be frequently sipped throughout a workout, tend to be very acidic and should also be avoided, especially when you are dehydrated. The underlying message: be aware of the full health benefits and risks of anything you consume, especially since marketing messages can be very misleading. 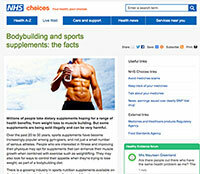 This article by NHS Choices in the UK (read the complete article here) warns athletes and health buffs against the harmful effects of taking sports supplements to improve their physique and endurance. Some of these health supplements that claim to “burn fat” may not have passed the safety standards and have been linked to a “small number of deaths”. The article also suggests that instead of taking dietary supplements such as protein powder, athletes can opt to eat protein-rich foods such as red meat, lamb, pork, eggs, dairy, and tofu. 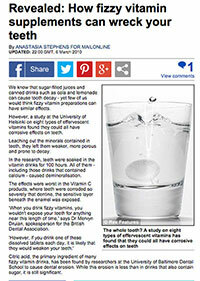 This article by the Daily Mail Online (read it here) is about a study by the University of Helsinki on how effervescent vitamins can weaken the tooth enamel, leaving it “more porous and prone to decay”. Athletes and non-athletes alike who take fizzy supplements should be aware that these type of vitamins contain citric acid, which has been found by researchers at the University of Baltimore Dental School to cause dental erosion. We’re keen to encourage all Canberrans to be healthy and active! If you have any questions about supplements and its effect on oral health, ask any member of our friendly team. Previous Post: Flaunt Your Smile!